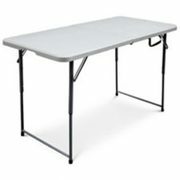 Folding Table is great for holidays, weddings, parties, crafts, tailgating and more. Recommended for both indoor and outdoor use. Impact and stain-resistant high-density polyethylene (HDPE) top. Folds for easy storage and handling and adjusts to three heights. Steel frame and legs support 400 lbs (181.4 kg); evenly distributed. Assembled Dimensions: 48" x 24" x 29" (122 x 61 x 74 cm). Folded Dimensions: 24" x 24" x 2.75" (61 x 61 x 7 cm). Weight Capacity: 400 lbs (181.2 kg). Unit Weight: 8.2 kg (18 lbs).